Forget mailing envelopes - economical mail pouches can be reused hundreds of times! The ideal solution for sending things back and forth between departments, branches, buildings and agents. Available in 4 sizes to manage everything from computer disks to presentation boards. Seven colors for your choice of color coding your your mail center. Specify a certain color for a specific location or operation. Please call if you need these bags printed or embroidered with your Company Name, Logos or other information. Colors - Please specify when ordering: Red, Blue, Black, Green, Tan, Yellow, and Grey. Need Address Cards? Clear plastic pocket holds optional address cards - order Model 1001. Need Plastic Cable Fasteners? Zippered closure and address card can be secured with optional plastic cable fasteners - order Model 1000. 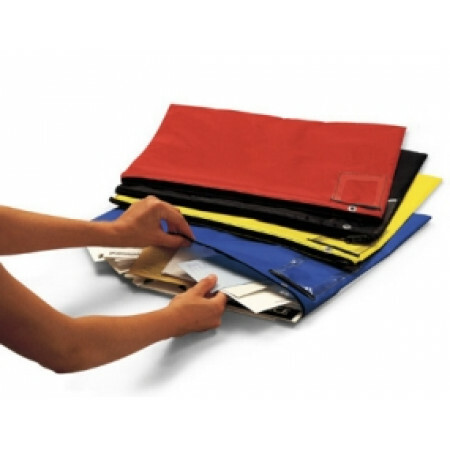 • Round trip mailbags are made of 210 denier nylon oxford fabric coated for water resistance. • Double eyelet is pressure fitted for extra strength. • Address pocket with postal cutout on round trip mailer is .020 clear vinyl sewn to mail bag on 3 sides and double sewn on open top for extra strength and easier address card insertion. Custom sizes and colors (on large quantities) are available, call for price quote.